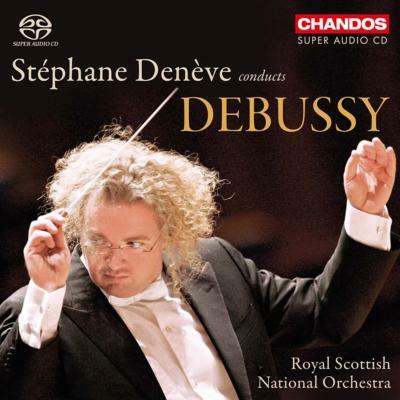 From Miles to Mozart: Debussy a la Stephane Deneve! Now here's an album I'm eager anticipating! I've already pre-ordered my copy from the UK classical music dealer, Presto Classical (it's official release date is 4/30/12, at least in the UK). I had the privilege to hear Stephane Deneve conduct the Boston Symphony Orchestra earlier this year in a concert of Ravel (Mother Goose Suite), Stravinsky (Concerto for Piano and Winds, with Peter Serkin), and Shostakovich (Symphony No. 5). The concert blew me away. I had not heard of Deneve prior to this performance (though he has received many positive reviews for his records of the orchestral works of Albert Roussel), but his talent was imprinted in my mind afterwards. Now he's releasing an album on Chandos of orchestral music of one of my favorite composers ... I can't wait!